Angelica Collection Now at 14KT! With over 1500 easily adjustable bracelets and charms with symbols from spiritual to whimsical, from romantic to sentimental, along with exciting new licensed products. Endless ways to let a woman show how she feels, what she believes in and who she is. Angelica is from the Royal Chain Group, a 35-year-old, 2nd generation family-owned company and one of the country’s leading and most respected manufacturers of jewelry. In addition, $.25 of each bracelet is donated to Generation Rescue, a national organization committed to improving the quality of life for those affected with autism. 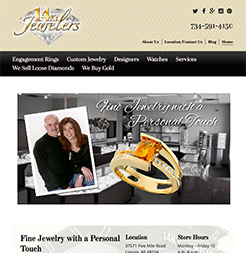 Nov 28 is Small Business Saturday(R), a day created specifically for small businesses like 14 Karat Jewelers. ShopSmall for the businesses you love, for the community you call home, and for the money that can stay in the neighborhood when we all Shop Small. This Nov 28, get up, get out, and Shop Small! We are proud to announce the launch of our newly designed website! We’ve made it bolder, faster, and easier to navigate everywhere you want it: computer, tablet or smartphone. Our site will be regularly updated with new images and tips on our blog, so check back often. If you have any questions or comments, please contact us we would love to hear from you. Thank you for visiting!